Lai (seated) takes the opportunity to use the visit to change his MyKad, while Bakrie (fifth right) and others look on. MIRI: The Urban Transformation Centre (UTC) here will officially open to the public from today. Speaking at a press conference yesterday, director of Sarawak Implementation Monitoring Unit (SIMU) in the Chief Minister’s Department Bakrie Zaini said all 14 agencies except 1Malaysia Clinic and Road Transport Department (JPJ) would be opening their counters today, ready to serve the people from 8am until 9pm daily (except public holidays). 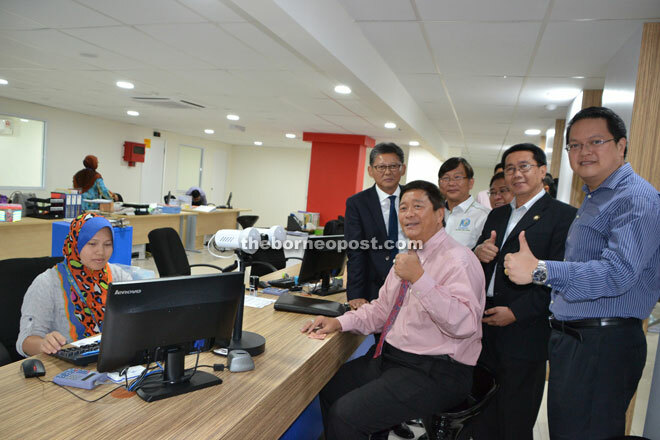 The agencies are Miri City Council, Sarawak Energy Bhd, Laku Management, Police, Inland Revenue Board, Treasury Department, Sports and Youth Department, National Registration Department, Welfare Department, Miri Resident office, Miri District Office and Immigration Department. The 1Malaysia Clinic and Road Transport Department will begin operation on March 19. “As the second UTC in the state and 13th in the country, we are looking forward to serve the people efficiently and effectively,” Bakrie said. He said that in 2015, statistic had shown that UTC Sarawak alone has served nearly 1 million customers. As of Dec 31 last year, over 11.5 million customers have visited 10 UTCs in the country. Meanwhile, MCC mayor Lawrence Lai said Prime Minister Datuk Sri Najib Tun Razak and Chief Minister Datuk Patinggi Tan Sri Adenan Satem would declare open the UTC here on April 2.